Moogle Gaps is a collection of digital ephemera, like the emptying of a desk drawer: stories and drawing, histories, natural histories, adventures and of course maps. What I'm calling "Moogle Gaps" is a play on the new standard for mapping, Google Maps. Unlike Google Maps, Moogle Gaps will animate the gray and green "gaps" in the landsacpe, turning these spaces into places. 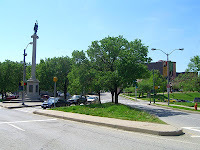 Place is a vague word and to narrow the concept I would define "place" as the connection between physical space and people. 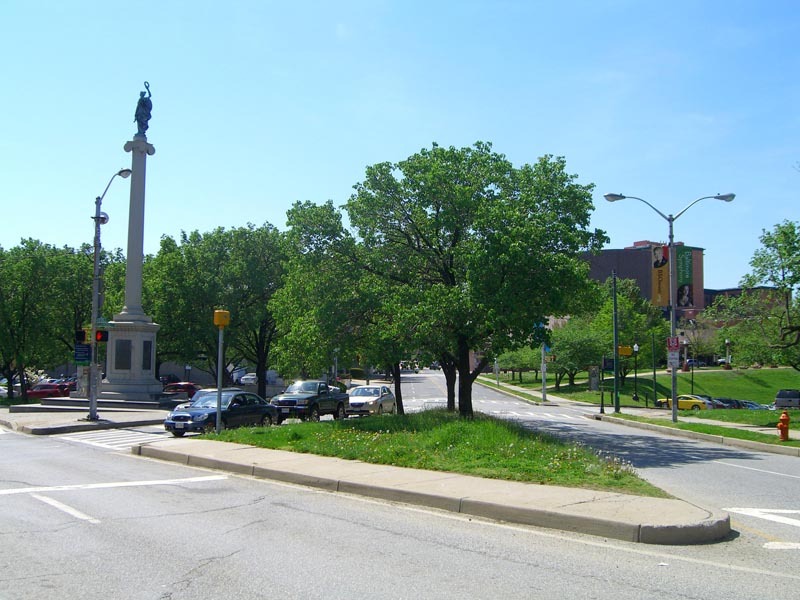 Place is created and ever changing, malleable both in physical landscape (think bulldozers) and meaning (think the Lorraine Motel). Unfolding these layers of meaning involves the making and reading of maps, the walking of boundaries, observing the cycles of birds and insects, and the questioning of history and culture. Place is at once unyielding like granite peaks and skyscrapers yet wonderfully temporal, contingent on ethereal things like the smell of hay, humidity, a creole accent or the sound of moving water. Spaces can be pinned to the wall on a map and photographed a million times yet these same spaces are somehow unique to each person, each time - this is place. I hope you enjoy and as always please contact me for questions, thoughts, or to share something about your places. 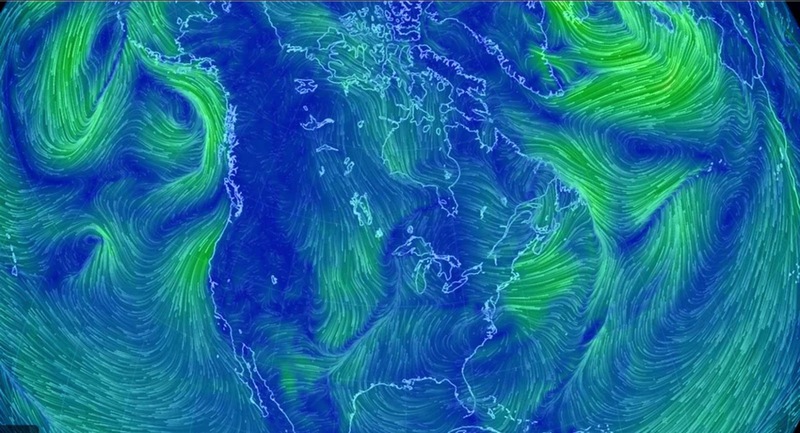 Incredible live animated wind maps of the globe. 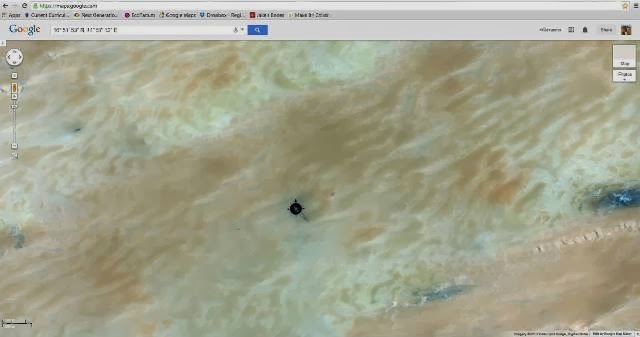 A strange image from Google Earth View. Read the incredible article about a memorial to the UTA Flight 772 that was hijacked and crashed in the Niger desert. Incredible moving map of the most popular female baby names over the past few decades from the Atlantic. April 1 and the baseball season is upon us. The long played out rivalry between Red Sox nation and the Evil Empire was finally put to rest in 2004. 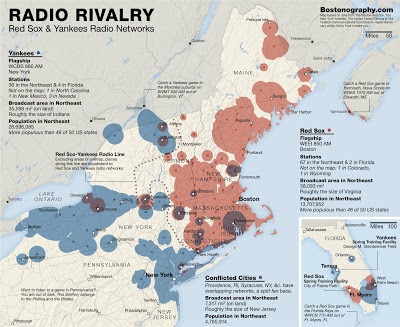 Today the rivalry remains a weak MLB marketing tool but for the fans there is still only one team to route for. The geographic boundaries of these fandomes are not as clear. Consider this map by the talented cartographers of Bostonography. The popular "front page of the internet" is a way to share, vote for, and comment on webpages organized by content categories. 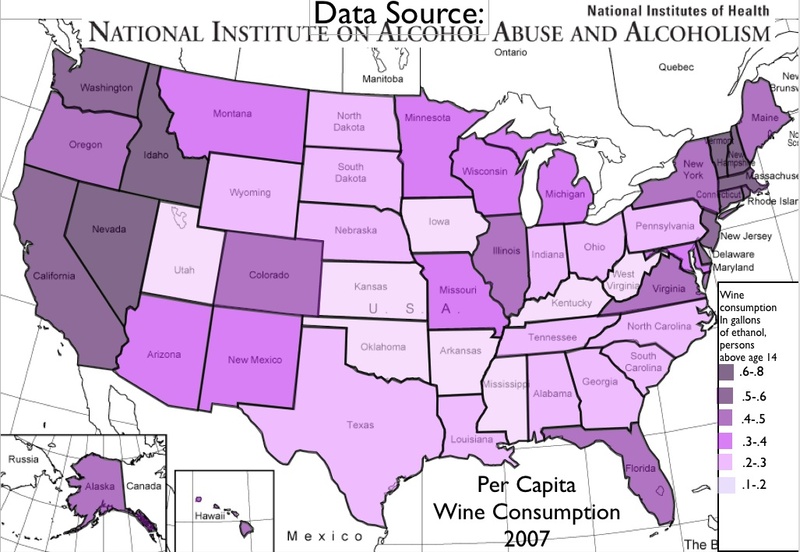 Reddit's map site is an incredible collection of online maps, cartography, and visual gems like "What New Yorker's complain about the most" and "Per capita wine consumption"
From a galaxy far.. far... oh wait turn left. 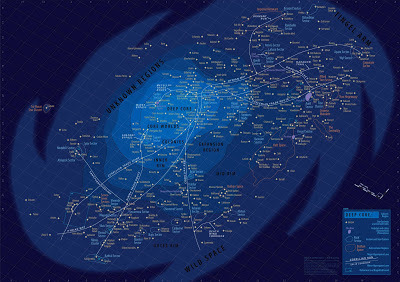 My friend Tim sent me this gem, a map of the Star Wars Galaxy. Maps based on literature and movies are wonderful exercise in unfolding the written word or the watched scene. 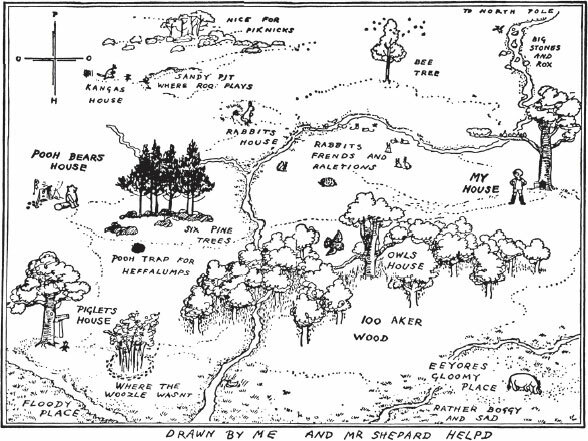 David Sobel writes about the power of mapping children's literature in his book Map Making with Children. 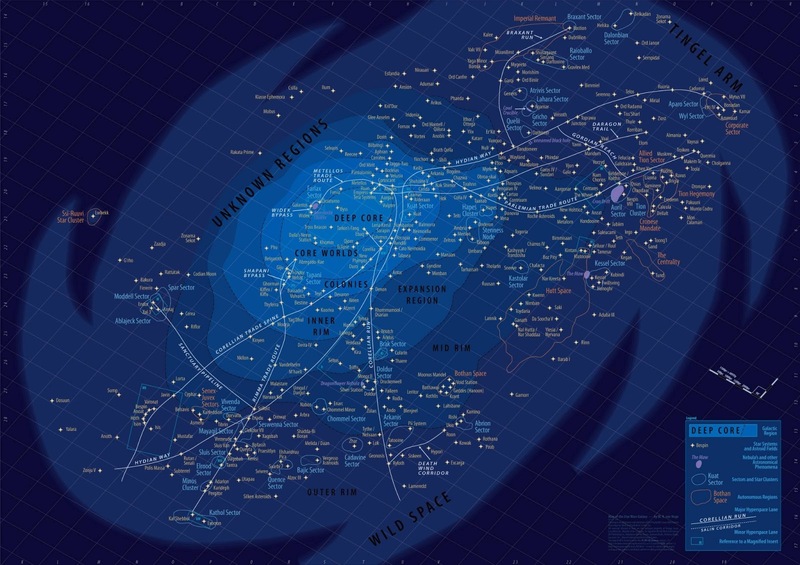 This map may be from a galaxy far, far away from familiar maps like those in Winnie the Pooh or My Father's Dragon but the sentiment is the same. My long time friend and once Appalachian trail hiking partner Tim responded to my reflections of the Appalachian trail summing up the highs and lows of our trip with, "In many ways, that walk set a mile-marker in my young mind from which all other destinations have been measured since." I couldn't agree more. The trip solidified in me a love of walking long walks, following lines, reaching goals mixing adventure, struggle, and a willingness to accept the unknown. 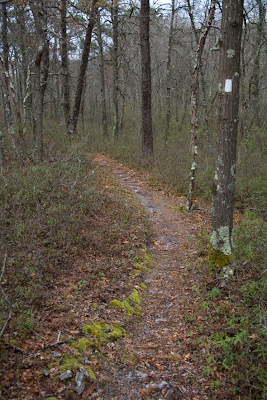 While the Appalachian trail is threaded by geology and represents a staggering monument to shared ownership and the conservation of green spaces on the East Coast, it does not really have a unified identity beyond, "if I follow the white blazes painted on trees, rocks, and old fences I will eventually get to Maine/Georgia." I am still fascinated by the idea of route following but have become more interested in following created or contextual routes more than established walking routes. One project that I recently came across is doing this in a real and very long way. 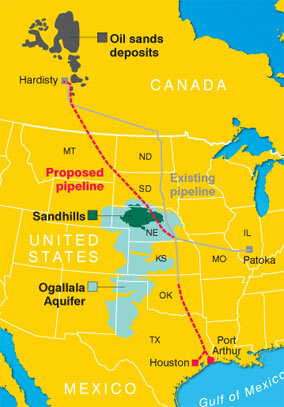 Ken Ilgunas is currently walking the entire route of the proposed Tar Sands - Keystone Pipeline. The journey of some 1,700 miles is well documented on his blog: Pipe Dreams. This proposed Canada to the Gulf oil pipeline was hurtled into the spotlight this past week when President Obama referenced climate change in his inauguration speech (the term did not come up once in the run up to the election) and then on the following day when Gov. Dave Heineman from Nebraska approved the new route for the project for the much needed job creation and financial gains for the state. Opponents of the project such as James Hansen of NASA calls the project basically "game over" for the climate. Author and activist Bill McKibben of 350.org has also taken a lead in publicizing this "non-topic" that has massive implications. For perspective the size of Athabasca Oil Sands area in Alberta is similar to Great Britain or the State of Florida. Please stay informed and have a look at Ken Ilgunas' great project at www.kenilgunas.com. 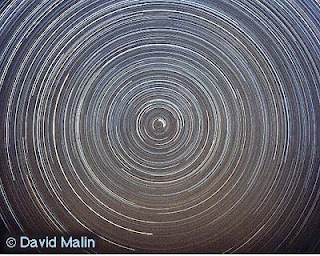 The North Star or Pole Star is simply a star named Polaris that happens to live directly above the north pole of the Earth. Lucky? Yes, the South Pole has no such counterpart. So what does it do? 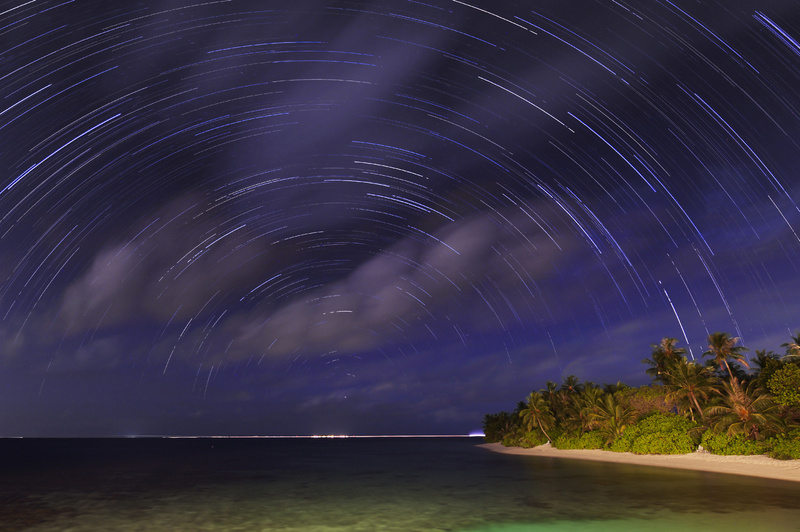 Each night and year the North Star plays out a fascinating truth about our minor, foot planted place on this planet. Imagine a Lego man with his feet stuck to the equator of a globe facing north. His body would extend out at a right angle away from the globe and as he's stares north from his sunny spot on the equator the north star sits exactly on the horizon. As the Lego man travels north from the equator the north star would appear to rise up from the equator. When the Lego man reaches Santa's workshop located smack dab on the North Pole the pole star is now, back-breakingly high in the sky, his little yellow neck is bent at a 90 degree angle watching the stars circle around the very pinnacle of the night sky. Time lapse photos give us the "record" effect of stars spinning in concentric rings around the center spot. What about us at "mid-latitudes"? 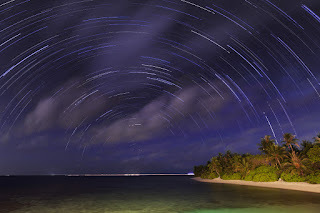 If we don't live at the equator, where the north star is 0 degrees above the horizon nor the north pole at Latitude 90 degrees north where the North Star is 90 degrees up from the horizon how to know where to look. My home in West Boylston is at a Latitude of about 42 degrees north placing the north star directly at... you guessed it 42 degrees below 90. 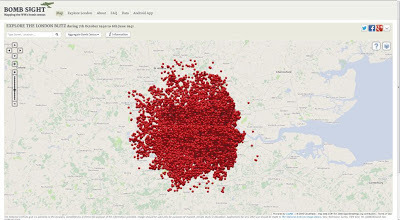 An interesting project overlaying historic data about the bombs dropped on London during the second World War with Google Maps. Explore it at Bomb Sight. Whether you burn a bush, light a candle, pop a cork, or watch football December 21st marks the winter solstice and we're told the beginning of winter. But what is the solstice? 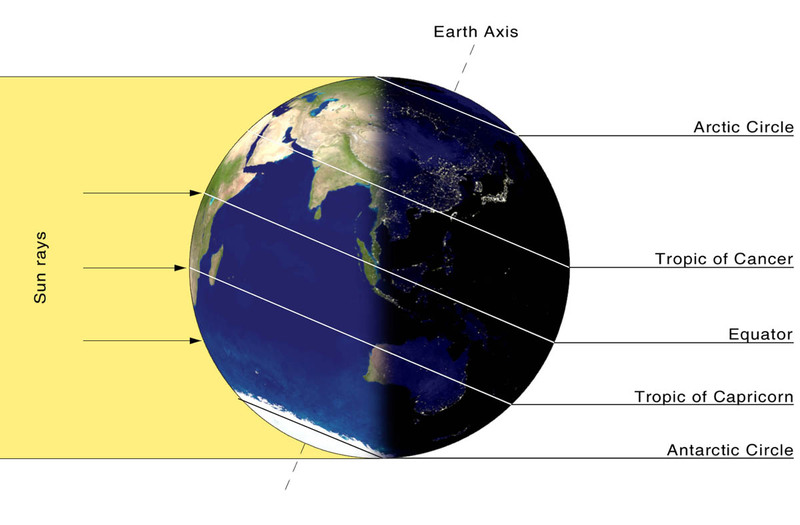 As the earth make's it annual orbit around the sun we experience a lengthening and shortening of daylight hours and fluctuation in mean temperature. This is all due to the fact that the earth is tipped on it's axis. This axial tilt of 23.5 degrees gives us seasons in the form of shifting temperatures and day light hours. After 365.25 spins the earth has traveled the enormous circle around the sun and and on the Winter Solstice the tilt of the axis is pointing as far from the sun as it will all year, giving the northern hemisphere less daylight and colder air temperatures (winter) and opposing (summer) for the Southern Hemisphere. 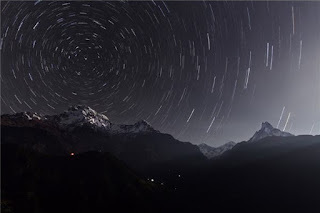 The Winter Solstice also marks an interesting moment for the earth. On this day the latitude of 23.5 South is the closest point on the earth to the sun. As the sun is so much larger than the earth we must think of its light as coming towards the earth like a bright yellow wall. It crashes over the earth illuminating 50% of the earth's surface at any given moment. The tilt of the earth makes it so the bulging, belly of the globe juts out towards the sun. On the winter solstice the point on the globe closest to the sun is latitude 23.5 degrees South better known as the Tropic of Capricorn. For all our friends in Brazil, Paraguay, Argentina, Chile, French Polynesia, Tonga, Fiji, Cook Islands, Caledonia, Sea Islands Territory, Australia, Madagascar, Mozambique, South Africa, Botswana, and Namibia when the clock strikes high noon in their country, for a few moments they will be the closets people to the sun. For us schmoes in the Northern Hemisphere, we are tipping away from the sun at an angle of 23.5 degrees and so experiencing less daylight, and cooler temperatures. In 1995 my friend Tim and I set off to hike the length of the Appalachian Trail from north to south. We spent the summer months working and saving, meticulously researching every piece of gear that we planned to carry on our backs. We made frequent, semi-compulsive, trips to all every outdoor supply store (a condition we coined the "gearies"). We were driven by the spiritual void of high school and a narrative of adventure that imagined us atop storm savaged peaks, and in pristine wilderness with moose and bears. The excitement of the adventure lay ahead and like Christmas eve we savored the anticipation. It didn't take long before we started pushing further from the trail. We began hiking at night, following the small dot of light from our headlamps, we hitchhiked more and spent longer in town. We explored side trails, and laid over at lakes and rivers, crashed on the dorm room floor of an old friend for a couple of nights. The adventure of the trail seemed to be occurring more and more off the trail. By Halloween we had had enough. Faced with the flattening, more suburban stretches of Connecticut, New York and Pennsylvania, dropping temperatures and a general boredom we hopped a bus home from North Adams, Massachusetts. When Tim recently sent me this lovely map of the Appalachian Trail as Subway Line I spent some time reminiscing on the two months we spent hiking and the nature of that adventure. In many ways this map is a perfect representation. Riding the subway is an act of magic. We leave the surface of the world and descend into the subterranean. We travel beneath the street, beneath the buildings, neighborhoods, and wires, beneath the traffic filled tunnels, and old Indian grave sites, beneath broken ceramic water jugs left by the Dutch explorers, and dinosaur bones. The cardinal directions loosen their hold, we follow a colored line and at the appropriate dot on the map we reappear into the sun-filled, chaotic world having missed everything between. 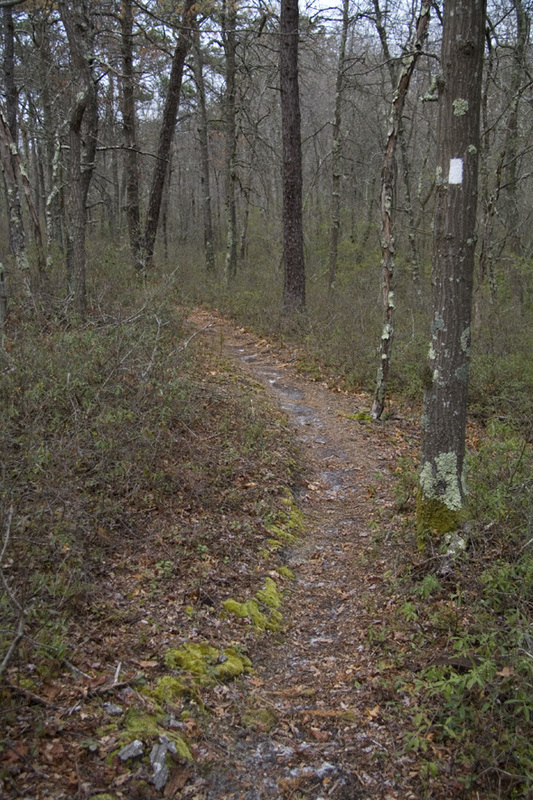 In some ways hiking the Appalachian Trail is like riding the subway. Head down, pack on back, pushing away the miles each day we followed the white line, hopping off at appropriate stops to buy food, shower, and call home. The moments that mattered were those when we came up for air. A moose in the woods, a swim in the river, beers with a Vietnam Vet, the Highland Games, and pints of ice cream. The miles of track that laid between these moments fade away into one long leaf-colored line. But the animated world through which the trail runs remains with me still. Happy hiking! Celebrate Google Map Street view with a parade, performance, theater and drama with the Street with a View Project. I listened to a great radio show from 99% Invisible on the creation of a new guide to urban places. Created by Graham Coreil-Allen a Baltimore based artist, the guide identifies the overlooked "invisible" architectural elements found in every urban environment. Read his free, online guide book, The Typology of New Public Spaces and learn how to identify such urban rarities as "gestural garbage, a freeway eddy, and anti-gates." A solar eclipse is a rare thing. We know this in practice but do we know why? A solar eclipse is in fact just the shadow of the moon on the earth's surface. Simple, yes? We can hold a ping pong ball in front of a lamp and block out the light of the lamp, no problem. But the moon is just ~230,000 miles from the earth while the sun is over 93,000,000 miles away and the moon, in comparison is minute! So the moon in fact is not blocking out the sun but rather casting a tiny, dark shadow on the face of the earth for just a short time. If we don't happen to live in the this small dark path we will not experience see the shadow and in turn not experience the eclipse. The map above is NASA's shadow map for the first half of the 21st century, showing us when and where the moon's shadow will travel, in turn showing us who will experieince a lunar eclipse in the next 38 years. 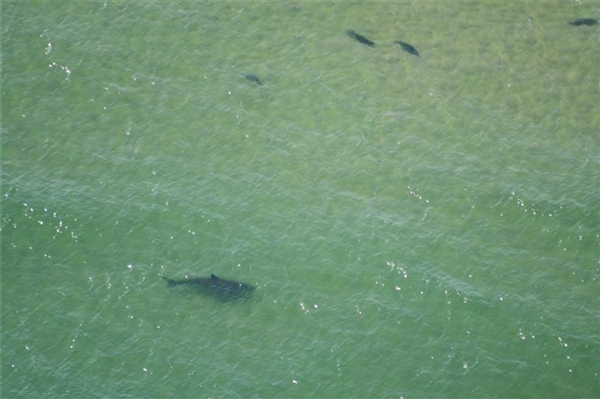 Travel to Cape Cod, MA and witness the resurgence of the Great White Shark in Massachusetts. Like a scene out of a David Attenborough special but photographed from space, the beach is literally covered in Grey Seals. Grey seals are not the doe-eyed, round-faced Harbor seals that arrive in the fall but rather the horse-faced seals that spend their summer lulling around in the warm, shallow waters off Cape Cod. To find the seals search for "Monomoy Point, Chatham MA" in Google Maps. View the map in satellite view and travel along the thin, all sand beach heading north along the eastern shore (up and right). Look for speckles in the sand and zoom in to view several large colonies of Grey Seals. Ebird (www.Ebird.org) is a collaboration between the Cornell Lab of Ornithology and the National Audubon Society and is dedicated to collecting and sharing individual bird observations from across the United States. The concept is simple, allow folks to enter their own sightings into the database and connect their sightings to a specific location and time. 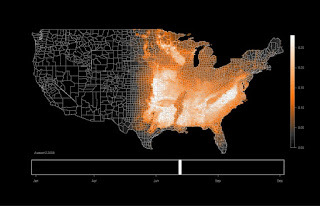 Since 2002 Ebird has collected over 3 million observations from bird watchers across the U.S. and has begun to process this raw data into usable, graphical information. The most impressive results of this project are the animated occurrence maps. What can only be described as amazing these maps overlay a black and white map of the United States counties with sighting data of a single species. Using a concentration of color, ranging from dusty orange indicating low frequency to bright white indicating high frequency the colors seems to shift and morph like an algea bloom. Movement depicts time as a sliding bar at the bottom of the map loops from January to December, giving the viewer an animation of seasonal observations from across the country. We can literally watch as Chestnut-sided warblers burst from the gulf of Mexico in April and flood northward in a matter of weeks, leaving the lower 48 by May, but for a few strips of breeding birds in the Appalachian mountains. Watch Longspurs descend from Canada in the winter or the mysterious migration of the Blackpoll Warbler. WallyGPX uses a bicycle, handheld gps and google maps to draw on his city of Baltimore. 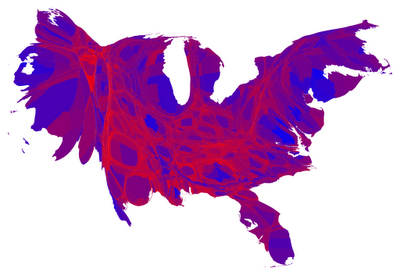 The 2012 elections are over and we finally can put away the state cutouts and red and blue paint for another four years. I don't think Americans have spent so much time starring at an outline of Ohio since its statehood in 1803. 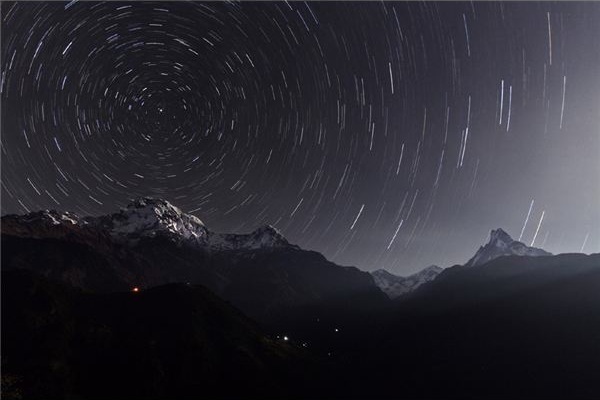 For one night the country was transfixed by tiny geographical outlines and the oscillations between blue and red. Geography lesson aside the hyper, flickering, buffering, updating % reporting election coverage did give us a chance to brush up on U.S. geography it did little to show the true geography or political belief. A series of maps created by Mark Newman from the Department of Physics and Center for the Study of Complex Systems at the University of Michigan helps unfold these problems. View the series of maps here. A reminder that the wavy edges of Ohio are created by the Ohio River to the South and Lake Eerie to the North. The pencil straight western edge was created by... well a pencil.